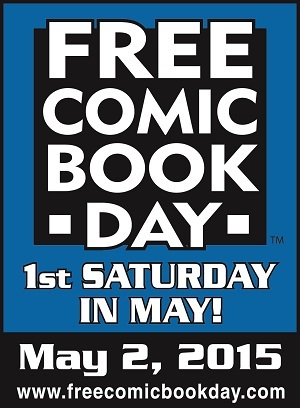 Free Comic Book Day, coming to Sterling Silver Comics on Saturday, May 2nd! Pretty much what it says up there in the title to this post…Free Comic Book Day is coming soon, to the store run by the fella who has participated in every Free Comic Book Day since the event began way back when! We will open at 11 AM that Saturday, and give away comics while supplies last! The earlier you show up, the better! You can get a sneak peek at what comics we’ll be giving away right here at the official Free Comic Book Day website! In addition, we’ll have other free goodies and special deals that day for you to enjoy. Our special guest will be Nat Gertler, publisher of About Comics, and he’ll be giving away copies of his graphic novels The Factor and The Licensable Bear™ Big Book of Officially Licensed Fun ! He’ll even sign them for free! We’re looking forward to having lots of fun at the store that day, and we hope you can join us! See you at the shop! This entry was posted in Store News on April 23, 2015 by Mike.